The sixth True-Life Adventure feature would set its sights North to the arctic region of the world. It took more than twelve photographers six years to gather all of the footage used in the film. Because of the harsh extremes in climate that this film was shot in, this was some of the first film footage ever shot in Antarctica. Like the other True-Life Adventures, White Wilderness opens with a paintbrush as the narrator explains the ice age and how it changed animal life on Earth. Animals highlighted in the film are walruses, polar bears, seals, beluga whales, lemmings, ducks, wolves, and wolverines. The film ends as the sun sets on snow covered mountains. 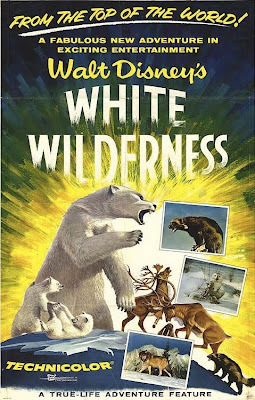 White Wilderness premiered on August 12th, 1958. Like the other True-Life Adventures, it received mixed reviews from critics. Those that disliked it couldn't get past the sometimes humorous narration and editing. Those that praised it were in awe of the footage featured. Audiences ate it up as well and it was re-released several times in theaters. It won an Academy Award for best documentary and was also nominated for best music. I'm not a big fan of White Wilderness and I think the reason is that so many other nature documentaries have covered the arctic region so well that this pales by comparison. However, it's still an enjoyable film. The True-Life Adventures are surrounded by controversy for staging sequences that didn't occur naturally, but the biggest example can be found in this film. Supposedly the crew purchased a group of lemmings and literally pushed them off a cliff to film the mythical mass suicide. Had this film been made today, animal rights activists would not have allowed it to happen, but in 1958 it was legal, albeit unethical. White Wilderness was released on DVD in 2006 as part of the Walt Disney Legacy Collection. It can be found on the first volume of the True-Life Adventures series where it has been fully restored. The DVD is now out of print and copies are hard to find. It is available on iTunes where it can be purchased in HD.